WHEN I AM reading Shūsaku Endō’s Silence (沈黙), I have to keep reminding myself that it is a translation, beautifully effected by William Johnston, whose prose unfolds effortlessly and elegantly like an unfurling scroll of Japanese calligraphy. It is not possible to praise this tale of religious apostasy highly enough for all the themes it explores, not least the meaning of personal faith in the midst of human suffering in a world gone completely mad. It is literature at its most perfect, accomplished, profound. Indeed, it is little wonder that its author was awarded Japan’s highest honour, the Order of Culture, shortly before his death. Shūsaku Endō (27th March 1923–29th September 1996) grew up in the unique position of being a Japanese Catholic, a motif he would explore time and again through his outstanding body of work; however, it is Silence, recently adapted into a motion picture by Martin Scorsese, that takes the issue of spiritual abandonment to its zenith and what ultimately is meant by the perceived indifference of the Creator, the “silence” of God. 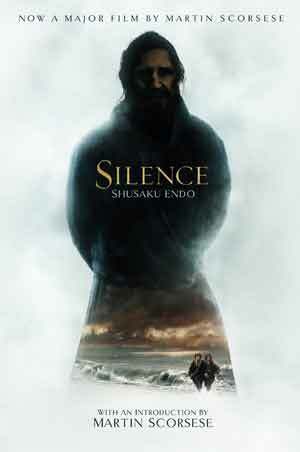 Set in seventeenth-century feudal Japan, Silence is an historical novel—part epistolary, part third-person narrator—recounting the journey of a Portuguese Jesuit priest, Father Sebastian Rodrigues, and his struggles as a missionary during a time when the practising of Christianity had become outlawed by the Japanese authorities, forcing it underground, known as “Kakure Kirishitan“. More specifically, it is the quest to find out what has happened to Rodrigues’ beloved mentor, Father Christovao Ferreira, who has reputedly apostatized (renounced his faith) under torture and subsequently disappeared without a trace. Following in the footsteps of the order’s co-founder, St Francis Xavier, Rodrigues and his companion, Father Francisco Garrpe set off on an arduous sea voyage to Japan via Goa and Macao. 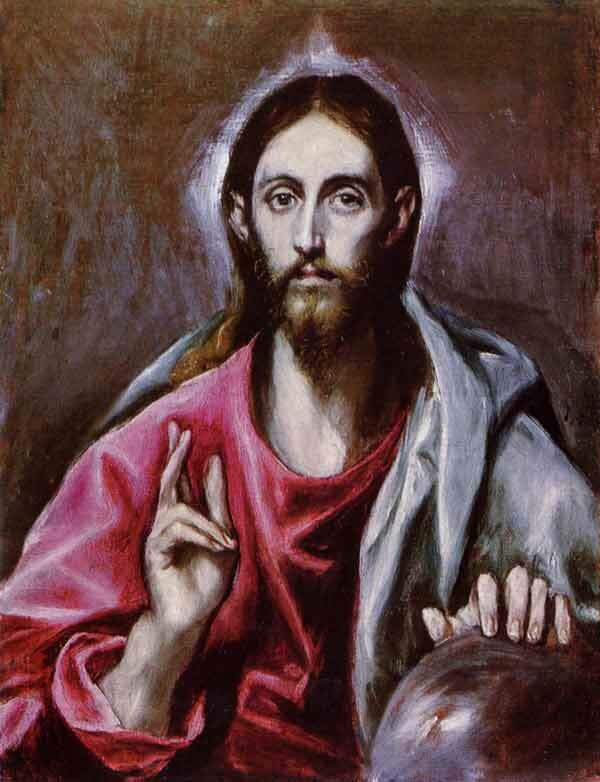 El Greco, Christ as Saviour. The Fathers are sheltered by the Japanese Christians until the authorities become suspicious and round up a selection of villagers to undergo the trial of the fumi-e, a bronzed image of the crucifix upon which they must trample with their foot in order to prove their non-allegiance to Christ. Unable to perform the symbolic act, the non-consenting peasants are crucified on crosses in the sea. Rodrigues likens the foreboding silence of the ocean to the foreboding silence of God during their martyrdom and is deeply troubled by the experience. God asks me to imitate the strong even though he made me weak. Isn’t this unreasonable? Why have you abandoned us so completely? He prayed in a weak voice. Even the village was constructed for you; and you have abandoned it in its ashes? Even when the people are cast out of their homes have you not given them courage? Have you just remained silent like the darkness that surrounds me? Why? At least tell me why. We are not strong men like Job who was afflicted with leprosy as a trial. There is a limit to our endurance. Give us no more suffering. Deciding to part company with Garrpe, Rodrigues’ final letter describes in achingly beautiful prose his solitary struggle with physical hardship, emotional suffering and spiritual despair. As he traverses the Japanese countryside, he compares his position to that of Christ during his final days before his own martyrdom, wondering if God even exists. In the afternoon, the sky brightened a little, reflecting tiny clouds in the pools of blue and white water which remained on the ground. Squatting down I stirred the water to dampen my neck, now bathed in sweat. The clouds disappeared from the water and instead there appeared the face of a man—yes, there reflected in the water was a tired, hollow face. I don’t know why, but at that moment I thought of the face of yet another man. This was the face of a crucifed man, a face which for so many centuries had given inspiration to artists. This man none of these artists had seen with his own eyes, yet they portrayed his face—the most pure, the most beauti­ful that has claimed the prayers of man and has cor­responded with his highest aspirations. No doubt his real face was more beautiful than anything they have envisaged. Yet the face reflected in this pool of rainwater was heavy with mud and with stubble; it was thin and dirty; it was the face of a haunted man filled with uneasiness and exhaustion. Do you realize that in such circumstances a man may suddenly be seized with a fit of laughing? I thrust my face down to the water, twisted my lips like a madman, rolled my eyes, and kept grimac­ing and making ludicrous faces in the water. 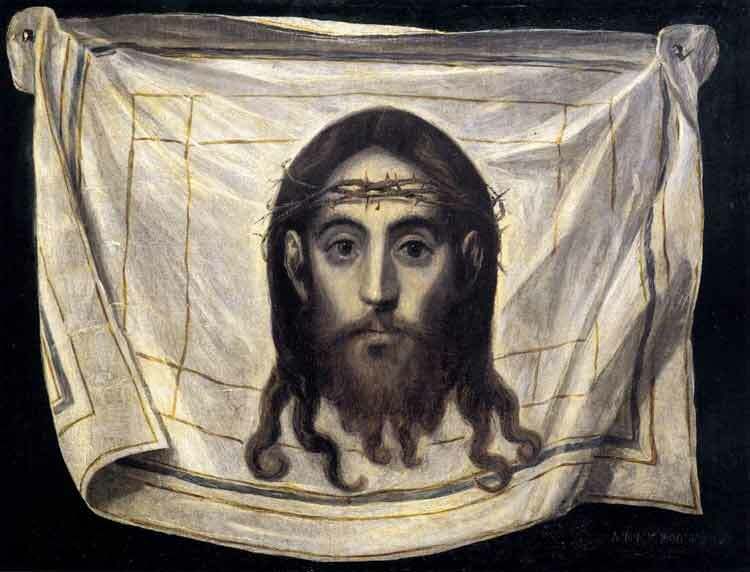 In Shūsaku Endō’s novel, it the Resurrection of Christ by Piero della Francesca, preserved in Borgo San Sepulchro, Italy, that forms the watery image of his crucified saviour and beloved; for Martin Scorsese’s adaptation, however, it is El Greco’s depiction of Jesus, most specifically the Holy Son’s face embossed on Saint Veronica’s veil, that becomes the enduring mirage in the pool. And just in the manner in which Christ is betrayed by one of his own disciples, Judas, Father Rodrigues is deceived by his peasant guide, Kichijiro, and captured by Inoue, a tyrannical magistrate, and summarily thrown into prison. As part of his psychological torture, he is finally taken to meet his mentor, Father Ferreira, now living in Nagasaki under a new name, Sawano Chuan, and writing books on the theological errors of Christianity. Raising his bowed head a little, Ferreira glanced at the priest. For an instant there flashed into his eyes a servile smile and momentary shame; but then wide­-eyed he looked down at the other deliberately and challengingly. But Rodrigues, conscious of his priesthood, was at a loss for words. His heart was too full to speak; anything he said would be like a lie; nor did he wish to incite even more the condescending curiosity of the bonze [Japanese teacher] and the interpreter who were gazing steadily at him. Nostalgia, anger, sadness, hatred—all kinds of conflicting emotions simmered within his breast. Why do you put on such a face? he cried out in his heart. I did not come here to condemn you. I am not here as your judge. I am no better than you. He tried to force a smile to his lips; but in­stead of a smile a white tear fell from his eye and flowed slowly down his cheek. ‘Father, so long since we have met …’ At last the trembling voice of Rodrigues broke the silence. Even as he spoke he was aware how foolish and silly the words sounded; but nothing else would come to his lips. And yet Ferreira remained silent, the challenging smile still lingering on his lips. The priest understood very well how the weak and servile smile could give place to this challenging expression. And it was precisely because he understood, that he felt he would like to collapse on the spot like a withered tree. Despite Rodrigues’ emotional demeanour, Father Ferreira remains calm and aloof; matter-of-factly, he explains to his former protégé that Western Christianity cannot flourish in Japan: “The sapling I brought quickly decayed to its roots in this swamp.” Furthermore, he goes on to expound that the Japanese Christian converts, rather than embracing the very core of the Christian teachings, are simply confused because the Latin word, Deus, sounds similar to the Japanese word, Dainichi, which refers to the ancient Oriental god of the sun. One set of beliefs has simply morphed into another. 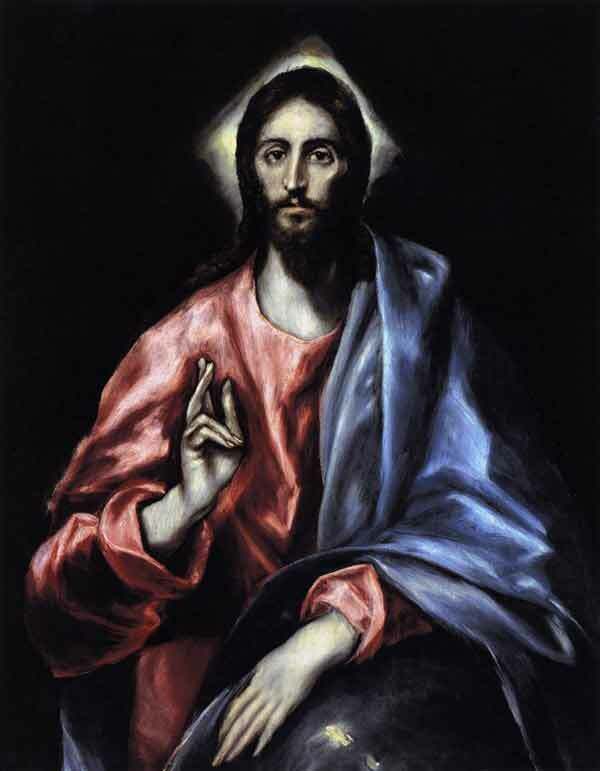 El Greco, The Saviour of the World. Rodrigues is appalled by Ferreira’s irreverent and sacrilegious discourse and yet when the time comes for his own test of faith, he is able to empathize with his former mentor’s position, making a choice that will change him forever. Indeed, Ferreira’s cool logic, so poetically and poignantly portrayed by Liam Neeson in Scorsese’s movie, makes us question the very validity of Portuguese Christianity itself, especially if we have an acclivity toward nondualist teachings. We must remember that the words of the Church offered salvation in a heavenly afterlife during a period of great political and social upheaval, including over taxation and famine, culminating in the Shimabara Rebellion. The Buddhist sutras may simply have not offered any meaningful solution or even hope to the poor peasants and the day-to-day problems they continually faced; and thus, as is so often the case, their new-found religious faith was inevitably the result of their utter rejection of Eastern Buddhism, not necessarily the revelation of a Western higher truth. Nonetheless, the irony is not wasted when we consider the essence of Oriental philosophy—it is within the stillness itself that God/Buddha nature is revealed. Certainly, Rodrigues is able to undergo a life-affirming transformation in the precise moment when he gives up all his precious perspectives and surrenders to “what is”. Moreover, in the dénouement of his spiritual odyssey, it is the noble silence that speaks to him, guiding him to do what he must ultimately do and setting him upon his final path toward everlasting life.